The postdoc in the spotlight this month is James C. (JC) Gumbart, a Director’s Postdoctoral Fellow in the Biology Division. An Illinois native, Gumbart grew up in Macomb, Illinois. He attended Western Illinois University where he earned a double major in physics and math in 2003, carrying out research on various computational problems related to electromagnetic phenomena. He then went on to the University of Illinois at Urbana-Champaign (UIUC) for a Ph.D. in Physics. Upon arriving at UIUC he initially did not know what field of research he wanted to pursue, but used classes and other research projects as a way to narrow down his options. During this time of exploration, it was his undergraduate research background as well as a survey course in biophysics that led him to discover his true calling in computational biophysics. Working under the direction of Klaus Schulten, director of the Center for Macromolecular Modeling and Bioinformatics, he focused on atomic-scale molecular dynamics simulations of various proteins and systems, including membrane channels and transporters,the ribosome and photosynthetic proteins. “Although I had little background in biology, I found it surprising easy to pick up along the way, once I learned the terminology, that is,” says Gumbart. He completed his Ph.D. in 2009, but decided to stay at UIUC for another year to finish projects already well underway, after which he applied for and received a Director’s Postdoctoral Fellowship from Argonne. After arriving at Argonne in January 2011, Gumbart quickly realized his fellowship gave him opportunities that were different than he had imagined, both positive and negative. He assumed Argonne would be just like a university without teaching, but found the laboratory to be much more complex. “It blends aspects of both business and academic environments,” says Gumbart. He was also surprised to find that much of the research performed is done on individual grants from the government. He discovered that transitioning from a postdoc to a staff scientist was far from straightforward and not always possible. However, Gumbart also found he was allowed greater independence in his research than at a university. This helped him to come up with new ideas without the immediate pressure to produce results. “The primary outcome of my research at Argonne has been developing novel methods for the application of atomic-scale molecular dynamics to questions related to bacterial cell walls, including their structure, growth and mechanical properties,” says Gumbart. At the same time, Gumbart has been able to establish his own collaborations with experimentalists, both on cell walls and on problems related to outer-membrane transport in Gram negative bacteria. His mentor, Benoit Roux, professor of biochemistry and molecular biophysics at the University of Chicago, has been extremely supportive and encouraging during his appointment providing advice and direction. Gumbart soon learned that many academic openings would have at least 200 to 300 applicants apply for a single open position. Thus, the search committees reviewing applicants were likely looking to triage applications quickly. Anything that he could do to make his resume get noticed was beneficial. He found that his postdoctoral fellowship, in particular, was viewed as a prestigious accomplishment. The second seminar is known as the dreaded “chalk talk” even though today a PowerPoint presentation is typically permitted. This seminar focuses on the presenters’ future research and goals. Gumbart chose to structure his talk around potential grant ideas, demonstrating that he was already in the primary investigator mindset — something universities are especially looking for. Ultimately, Gumbart advises postdocs to always have a long-term career plan in mind. It can change over time, but the focus should remain on building a strong CV, setting reasonable goals and keeping one’s options open. Each experience and position will help build a foundation for a successful career in science. 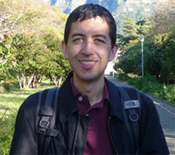 James C. Gumbart is a Director’s Postdoctoral Fellow in the Biology Division. He received a bachelors degree in Physics and Math in 2003 from Western Illinois University and his Ph.D. in Physics from the University of Illinois at Urbana-Champaign in 2009 He will begin his tenure as Assistant Professor of Physics at the Georgia Institute of Technology in January 2013. 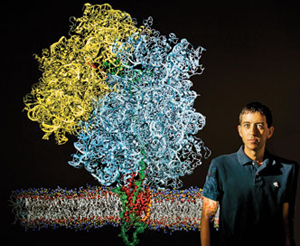 His research is characterized primarily by the application of molecular dynamic simulations to problems fitting two major themes: synthesis and maturation of proteins and unique bacterial systems and structure. This entry was posted in Postdoc Spotlight and tagged gumbart, postdoc spotlight. Bookmark the permalink.